Right up until the last moments of the book, Approaching the Speed of Light leaves readers wondering what will happen to poor, broken Jody. 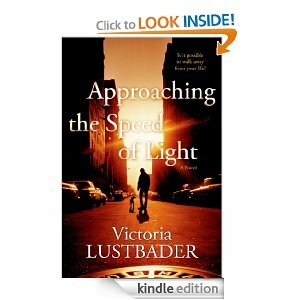 The author, Victoria Lustbader, draws the main character with such precision that any person who has ever been hurt or watched someone hurting can identify with some of his story. Somehow none of the options laid out for him seem precisely right, and Lustbader helps the reader come to terms with the varying array of hope and hopelessness so that the ending, which should be explosive, seems just right, almost sedate, – in the best sense of the word. The inner life of Jody, the protagonist, comes through in several different ways, including first-person narration, but also in third person stories written by the character about his childhood. Jody’s childhood was anything but normal, however. There are elements of great kindness in it, but the kindness comes from an evil source. Somehow, the author evokes pathos for such evil by highlighting Jody’s starved boyhood and his craving for love, a craving that never quite leaves him, despite his protestations to the contrary. After all, don’t we all crave love and kindness at the most basic level? The variation of voice and style, as readers drift through and around Jody’s vision, does not impede the flow of the work, but instead adds variety. When grappling with point-of-view issues, Lustbader keeps the reins tight, not wanting to get lost in other voices. Make no mistake, however, the other characters are as deep and rich as Jody, as seen from his lens. The plot of the book is not always straightforward, and readers have to have patience with the way it unfolds. It is worth the wait. What I found most interesting about the plot is the way Lustbader convinces me to mildly “suspend my disbelief” when a story takes a particular turn or something happens that seems too unreal to be true. I didn’t mind “going there” with the prose. Coincidences happen when they shouldn’t, and there seems to be something mystical afoot that the author does not address directly, but allows the reader to find for himself. This book is one I will be recommending to my book club since it is rife with possibility for discussion. In addition, I will be looking at it further to learn how to create characters with such depth and emotion, painted with a few spare words. There are so many ways to approach the story that I’m looking forward to sharing it with others – and to further make meaning of it for myself. 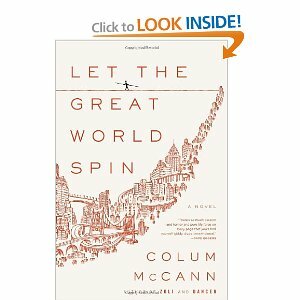 This month’s book was Let The Great World Spin by Collum McCann and I spent last evening in the company of six delightful women discussing it, several related books, and various other topics germane to reading, but also to women in general. Being a member of a book club, especially one like this, is a real gift. A while ago someone told me that book clubs these days are like the consciousness raising groups of the sixties and seventies for women. I am not sure if I agree with that statement fully. For sure, women need the support of other women, but book groups don’t have an agenda like those groups did. Those groups back then had the awesome job of creating change in the way women thought and the actions they took. I do feel my group exists partially as an extension of those times; without the work those women did together in the sixties and seventies, then my group would not exist. We sometimes discuss the place of women in society or the glass ceilings of modern companies, but not as often. We still discuss our children, but more in terms of the future and the world that they are facing. Our group is free to discuss the future in an unobstructed way so that we can all see the realms of possibilities that lie before us. That’s the legacy we’ve inherited. Mostly, however, we stick to books. We discuss characters we loved – or hated. We discuss the methods by which the author brought those characters to life. We discuss which characters are dynamic and fully human, and those that fall flat and are not believable. We discuss the plot and how we might have acted in the same circumstances. We talk about what other material this particular book reminds us of – because it always reminds us of something else we’ve read – either together or on our own. We are all voracious readers. The women of this group are an eclectic mix of working and non-working, older and younger. Some are involved in their children’s schools, and some are not as involved. Most are American or have had a lot of American experience. Without fail, all of them are bright and engaged humans, willing to take apart the issues of the day as well as the pages of a book. Oh don’t get me wrong – there are plenty of laughs to be had. Some of us are teachers and gleefully share the escapades of the day. Heck, all of us share wacky husband or children stories and we laugh uproariously. And here’s the rule: what gets said at book group STAYS at book group. It might as well be Vegas. Last night we had a lot to say about the book, which all of us loved. That doesn’t happen all the time – most often some people like it and some don’t; that’s what keeps it interesting. We discussed the way McCann uses the idea of groups to illustrate relationships between people; the discussed how the character of the artist woman is too flat and not believable but so many of the other characters are so rich and full of pathos. I didn’t like the character of the judge that much, but other disagreed with me. Therein lies the beauty of having a group of thoughtful, engaged women together – we can agree, disagree, discuss and enjoy the process. Because we live in Tokyo in an expatriate situation, we sometimes lose group members when they repatriate or move on to the next assignment. In the precarious economic environment of today, it happens more often than we’d like. We do have the core group of long-timers, of which I am fast becoming a member, but it is painful when we lose a compatriot. We are all bracing ourselves for a loss this December, in fact, and have picked up the pace of our reading a little bit so we can get in as many meetings as possible while she is still here. We are also getting ready to have a new member join us next month, something we do somewhat sparingly. It’s part of the process, so we will bring our new member into the fold and hope that she enjoys the meetings and shares the delight of books and each other, as much as the rest of us do. I feel privileged to belong to this group. Next month we’re reading A Visit From the Good Squad by Jennifer Egan. I’ve already started and I love it – but more than that, I am really looking forward to the meeting and discussing my thoughts on it with these great women.